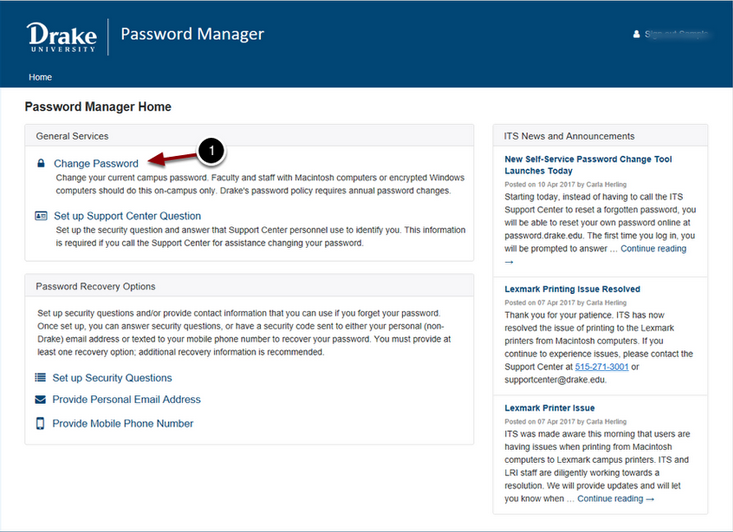 If you are an incoming student, your default password has been set to your birth date in the following format: MmmDDYYYY! (example: Jan011997!). IMPORTANT: Make sure to immediately update your other devices with your new password so you can continue to access the wireless network and email on each. Failure to do so will result in you being temporarily locked out of your account. Visit password.drake.edu in any browser. 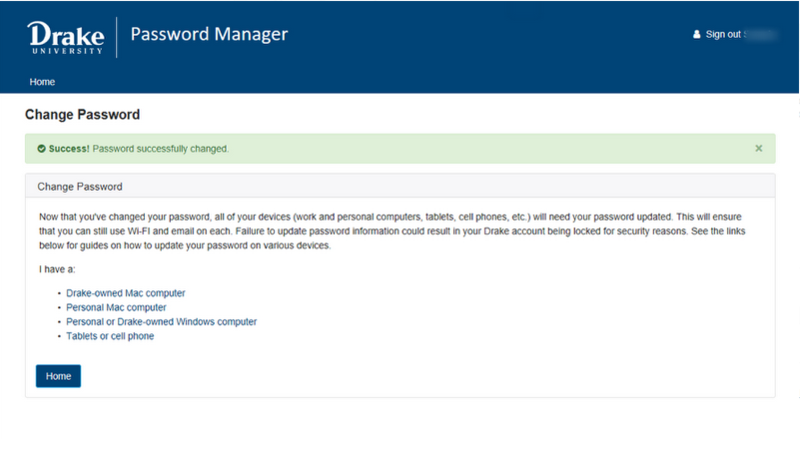 NOTE: Faculty and staff should change their password on campus, using their Drake-owned computer, whenever possible. This allows the new password to sync to Drake systems. 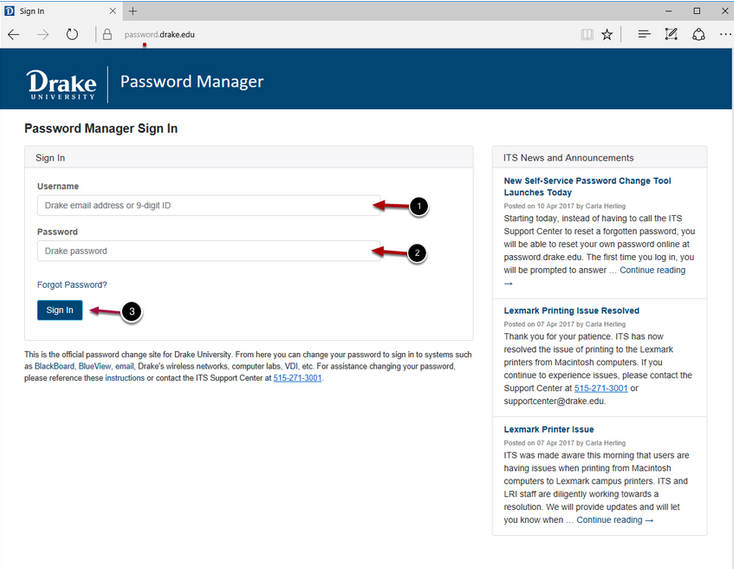 Faculty and staff may change their password off-campus but will need to continue using their old password on their Drake-owned computer until they return to campus and connect to the Drake network. Enter your Username (Drake ID number or email address). Enter your current or default Password. 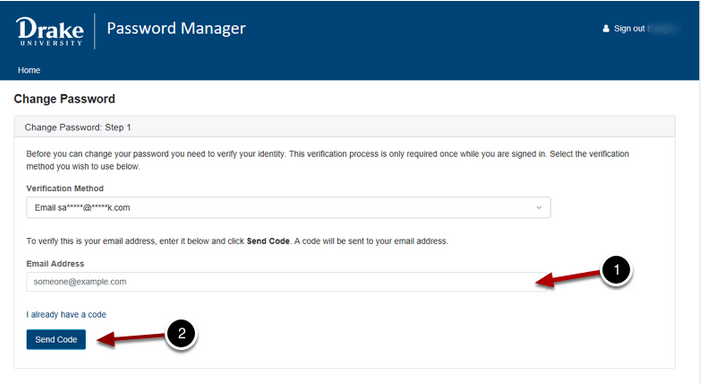 Click the arrow to view your verification method options. Depending on previously provided recovery information, you will be prompted to verify your identity before you can change your password. You can choose between using a non-Drake email address, a mobile phone number for text messaging or supplying answers to security questions. Following are steps to take when selecting each of these methods. Enter your Email Address. It should match the partially obscured email in the top field. Enter your Mobile Phone Number. It should match the partially obscured phone number in the top field. Enter the answers to the Security Questions you chose. The questions below are just examples. NOTE: Answers are not case-sensitive. 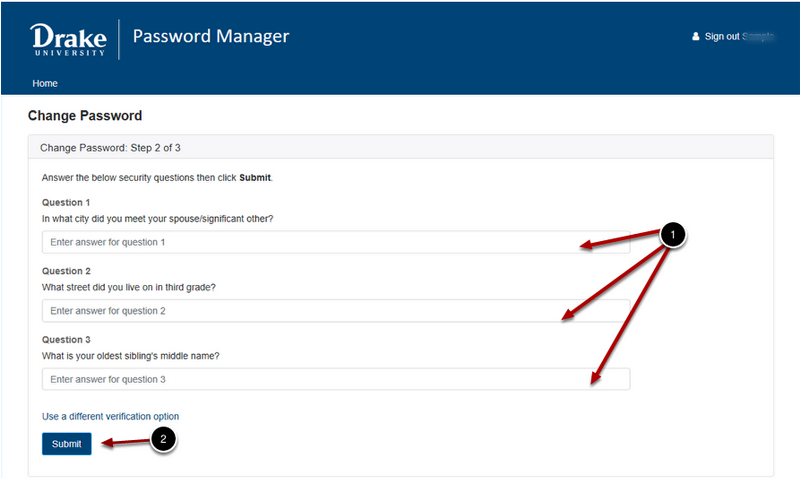 Once you Submit, as long as your answers are correct, you'll be taken to the screen to change your password. Go to Step 10. Enter the verification code you received. In this example, it's showing what the screen looks like if you requested the code via text message. Enter a New Password. It must follow the guidelines indicated. 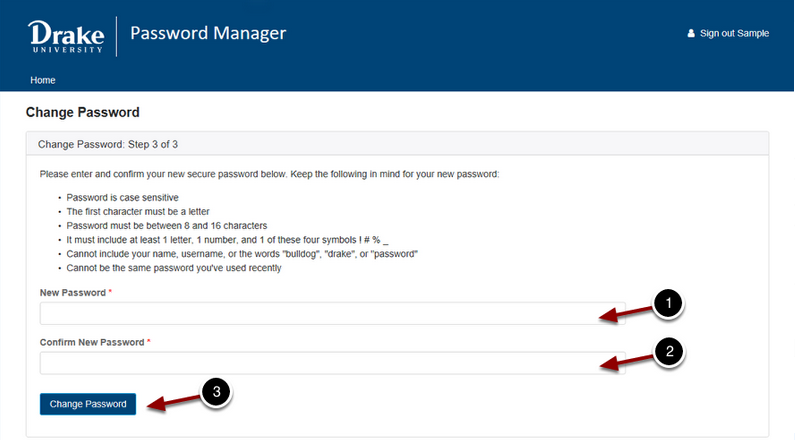 Confirm New Password by entering the password a second time. IMPORTANT: Immediately update your other devices with your new password so you can continue to access the wireless network, your calendar, and/or email on each. 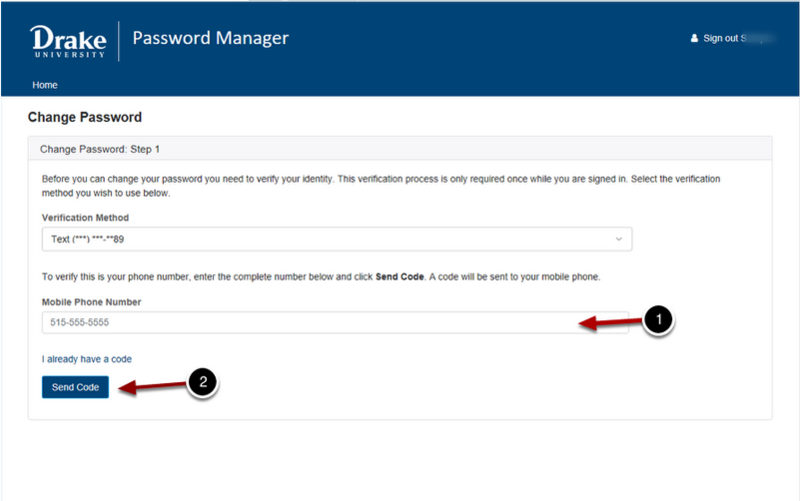 Restarting each device will ensure you're prompted to enter your new password. Failure to do so will result in you being temporarily locked out of your account.